Crocket HS Principal Craig Shapiro walks down the school halls among students after the launch of a new entrepreneurship program. Some public schools in South Austin are teaching students how to become business leaders. They’ve implemented an entrepreneurship program for kindergartners through high school seniors that’s the first of its kind in the U.S. The Austin Independent School District unveiled the program at Crockett High School yesterday. What can elementary school students learn about being an entrepreneur? First grader Cambelle Clements says she’s already learned a lot about how to make and sell things. This year, for instance, her class made "leaf people." “We get the leaves off the tree, real leaves, and then we glue them on to a paper, and then we make their faces, and then we sell them," she explains. Cambelle goes to Cunningham Elementary, which is one of two elementary schools who're implementing an educational program they call a "microsociety." In one of these microsocieties, students from each grade level run different types of businesses to learn various life skills, like communication or how to empathize with others. By the time students get to fifth grade, they run the microsociety, with a mayor, a city manager, and a radio station. In middle school, students learn how to code and develop websites and video games. Sixth grader Gauge Villareal says he likes that it makes school more hands on. 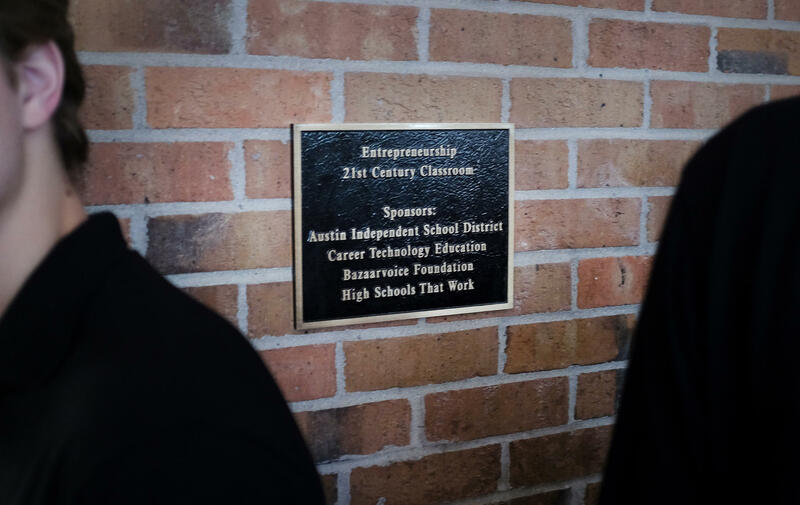 The Austin Independent School District unveiled a new entrepreneurship program at Crocket High School Tuesday. “It’s more being social than bringing out textbooks and going through a page and doing work," he says. In high school, students learn more concrete ways to run a business. In their junior year, they’ll create an idea and pitch it to actual investors, like contestants on TV's Shark Tank. Investors will fund the projects, which students will run their senior year. “There’s no teachers nagging you to do work. It’s ‘you get it done or you don’t have a product to show your client or customer,’” says Iza Castillo, a freshman in the program. Most of the program is paid for by the Bazaarvoice Foundation with some federal and district money as well. The new school year starts today for thousands of students across Austin, but a growing number of students in Austin public schools don’t have a home. Last year, more than 2,600 students in the Austin Independent School District were counted as homeless, which is up from just over 2,000 in 2012. Most students in the Austin Independent School District returning to school today are minorities, but many of those students won’t see a minority teacher in front of the classroom. State data show there's a large diversity gap between teachers and students in all Austin high schools and middle schools. Every single Austin middle and high school has more white teachers than teachers of any other ethnicity. Individually, schools have teaching staffs that are anywhere from 46 to 87 percent white. Last year, 25 percent of the district's middle and high school students were white. This week, the Austin Independent School District holds its annual gang resistance and training summer camp for students. For the Austin ISD Police Department, which organizes the event, it’s just one way to try to eliminate gang activity on campuses. Austin ISD Police Chief Eric Mendez says his department has two goals when it comes to gang activity. First, keep it off campus. Second, make sure students aren’t joining gangs. “We want to catch them when they’re more statistically inclined to engage in criminal activity or criminal gangs,” says Mendez. In the midst of a national discussion about Confederate symbols, some residents in Austin's Hyde Park neighborhood want the school board to change the name of a local elementary school. Lee Elementary was named for Confederate Army Commander Robert E. Lee. "To honor him with naming schools after him is, I think, just inappropriate," says Teresa Griffin, a Hyde Park resident for 25 years and member of the Friends of Hyde Park Neighborhood Association. If Schools Drop Confederate Names, Would District Consider Asian-American Names as Replacements? The discussion over whether to rename Austin schools named after Confederate figures probably won’t be decided until the end of this year, but one city commission already has a list of names they’d like the school district to consider.